It’s been brought to my attention that the symbol of the pentacle could also be the symbol of the goddess Venus. 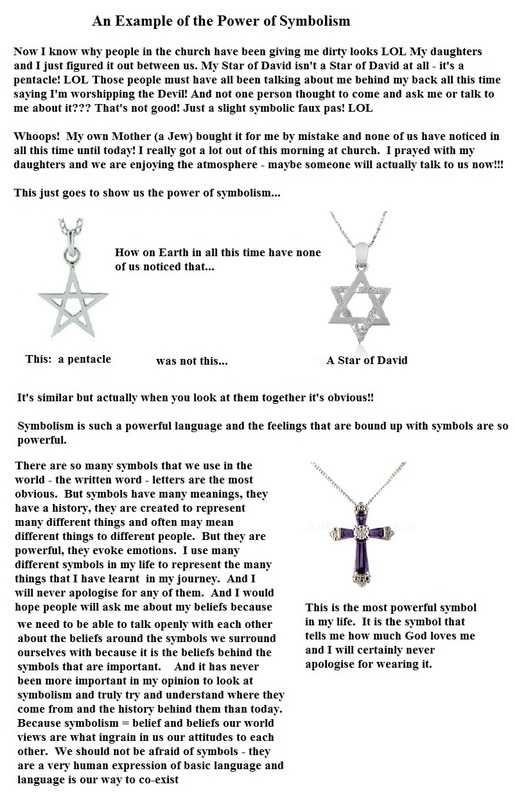 I’m not sure but it just proves my point that different symbols mean different things to different people at different times. Symbols also seem to evolve over time. I may well add to this post as I discover more, when I have time. I thought I would add this following picture to illustrate both of these points. I can see this post just growing and growing as I add more info relating to symbolism. I just found this and thought it was quite incredible so I am adding it here. Crop circles (another fascination of mine) may also make an appearance later on. I will not stop my investigations that appear as if they are usually fueled by coincidence and chance – I don’t want to miss anything that could be a divine message. My take on Divine Symbology encompasses science and mathematics and perhaps when we look at the divine nature of God through the eyes of infinity through these symbols we may come to an understanding of other parts of reality such as time and space and alternate dimensions. And at the centre of it all I can still see the cross, the heart of the whole, the om, heart chakra, love energy that leads back to Jesus – so Love is the centre of everything! In response to this thread on another site, someone just posted simply “Fairy tales”. This is my response to that – What are Fairy Tales? They are humanity making sense of the world through the narrative structure of stories – language – that most symbolic structure of all in humanity that helps us to transmit ideas – ideas that come from our imagination – what is imagination but the creative thought process that brings into creation that what once did not exist – WE create our reality and imagination is the most powerful tool humanity has. Might I just add to that that it is said that God has given us ‘Free Will’ – what is free will? To me it is the gift of imagination. 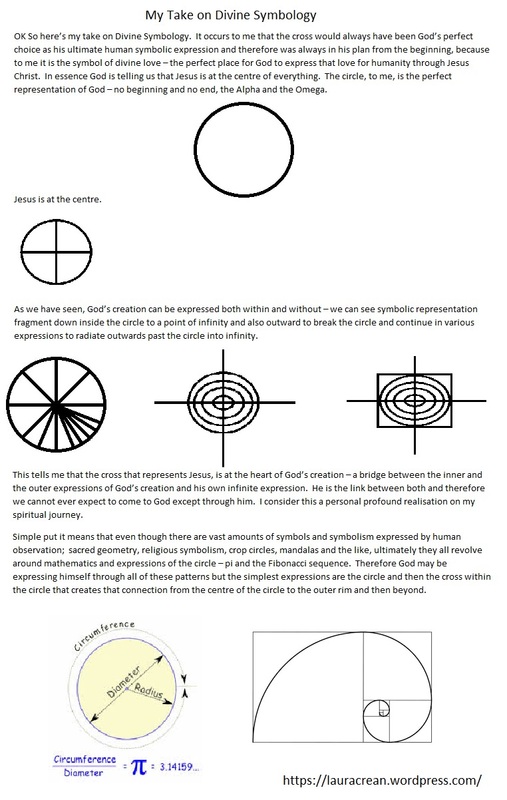 OK so now I have established that all this symbolism points to God and God reaching out to us in love through Jesus Christ, who is the bridge, that point at which dimensions of time, space and the reality we find ourselves existing in interact. Jesus (everything that he represents which is basically LOVE – of God and God’s creation – us – loving ourselves and each other) is literally the Rainbow Bridge, the tunnel of light, the concept of the wormhole – he is the way, the truth, the life – the only way – to come to God, to live free, to live eternally, to escape sin and Satan. Who is Satan? Satan is the power that is dominating and enslaving humanity. The power behind everything that keeps humanity blind and stumbling around in chains of servitude – separated from each other and separated from the truth – and that power is a dark, hidden, deceitful entity that controls humanity through money, deception and fear – controlling us even as we don’t realize we are being controlled, like puppets, dancing to every step we are taught. We are born into an illusion that is fed through the media and through the very societal systems that we live in. How can we jump onto that bridge and cross over to freedom? By waking ourselves up to the truth, and the truth is we have to learn how to perceive reality as it truly is, we have to stop looking at the world through the rose tinted glasses of Satan’s illusion and focus in to a new reality, the reality that we can be free if we break the chains that bind us. But we cannot do that in the reality we are currently living in. We cannot be free whilst living in this reality and we need to come together and effect the change we want BEFORE Satan fully forms his NEW WORLD ORDER because then I fear it will be too late! The only way is to see that we are all connected from the very moment of creation. Every cell, every fiber of our being is linked to each other, to the Earth, to the cosmos and to God and that we are in fact from one original source. We are one body, one entity and by giving in to sin and to Satan it is only ourselves, that one body that we are hurting, killing actually. I don’t want to die I want to live and live in freedom – don’t you? So we need to become consciously awake as ONE consciousness not as individuals separately trying to stumble around and make a difference, we need to think together, act together and Love together. By acting and thinking as one entity, Satan will have nobody left to control. This is how that one sacrifice can make the difference – through Jesus we become that ONE body of love that CAN create a new reality. Reblogged this on The Well in the Garden.